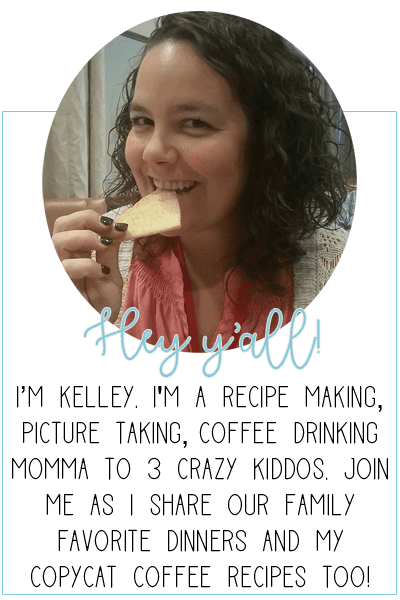 If you are looking for an easy dinner recipe to serve the family, I got you covered. This easy mozzarella chicken is one that the whole family will love and it’s gluten free and Keto friendly! Let me walk you through how to make this recipe. Let me tell you friend – I totally get it. I get how hard it is to find a dinner recipe that the WHOLE family will love. If one kid likes it, the other complains and asks if this is really what we are having. The poke their fork at it and try to make it look like they have eaten something. The other is happily clearing there plate. That is our dinner situation more nights than I can count. 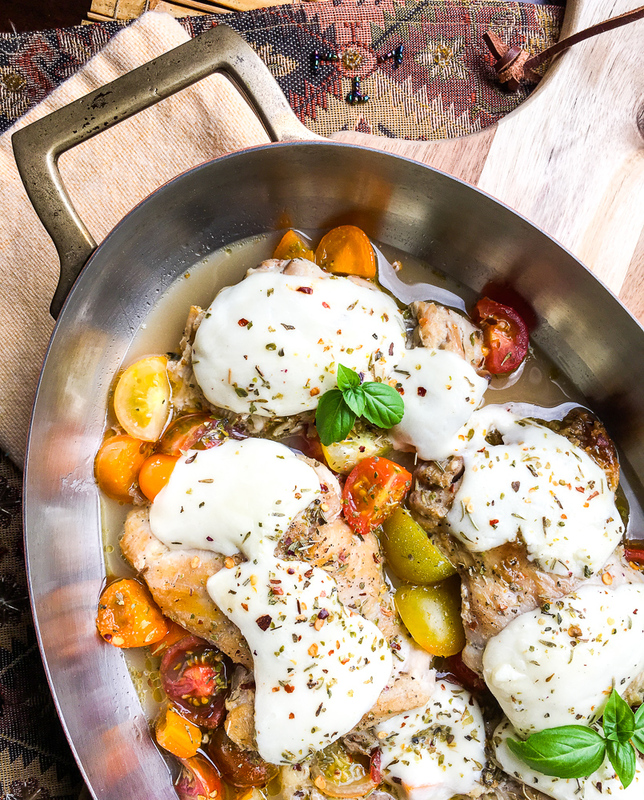 But this, this easy mozzarella chicken, is one that the whole family will love. AND it’s easy to make (hello one pot meal!) and it’s Keto and gluten free! Yes, that might have been angels you heard singing from above. 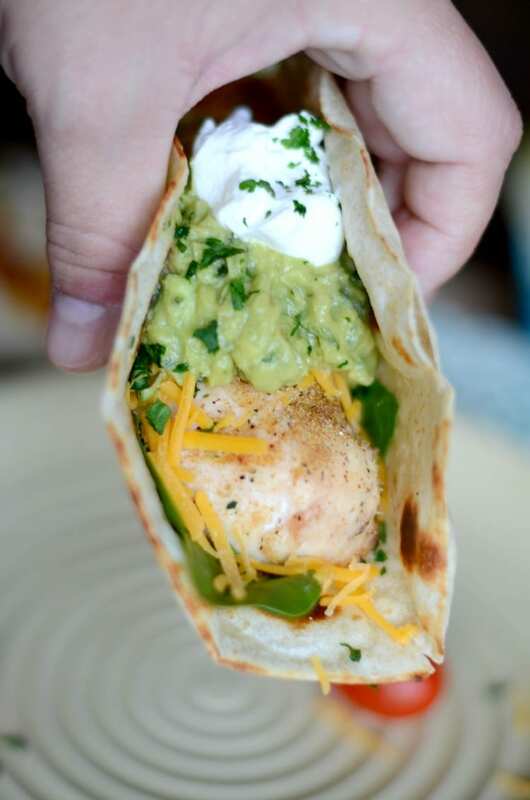 This quick and easy dinner recipe is a combination of a couple of things. First, it’s easy and made all in one pan. The chicken is seared in a skillet and then transferred to the oven to finish cooking. 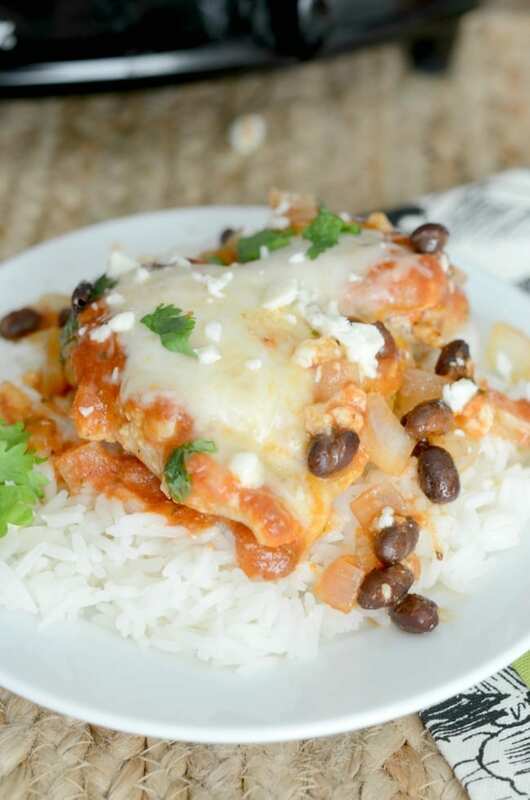 The result is a juicy chicken dinner covered in mozzarella cheese that is full of flavor. 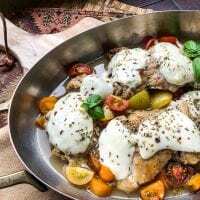 Mozzarella chicken is also low carb, Keto friendly and gluten free. But if you don’t tell anyone that, they will never guess that this tasty recipe is good for you. Make sure that you have a skillet that you can transfer from the stove top to the stove. You can do this with most cast iron skillets and some metal ones as well. It should tell you on the bottom if it is oven safe. You can use any type of chicken in this recipe. Breasts, thighs, tenders, bone-in. 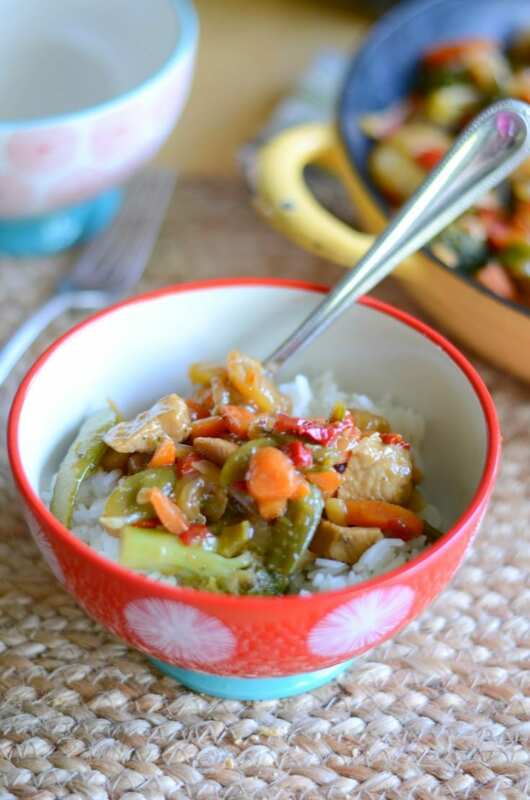 Whatever type of chicken you like can be used in this gluten free recipe. You need a few different spices for this recipe. Start with Italian seasoning for the chicken. (If you want, try this homemade Italian seasoning blend! It’s my favorite!) You will also need salt, pepper and red pepper flakes as well. To keep the chicken from sticking from the skillet and to keep it moist while baking, you will need butter and olive oil. Any brand you prefer works here. I would suggest using real butter and not a margarine or butter substitute. Before you add the skillet to the oven you need a 1/4 cup of chicken broth. I try to use organic broth whenever possible, but whatever you have on hand is good. You can even use homemade chicken broth or bouillon. The are rainbow cherry tomatoes in my dish, but any type of cherry tomatoes work here. Heck, you can even dice up a large tomato and use it in this recipe. Last but not least, the mozzarella! The cheese! You want fresh mozzarella here, not shredded. My grocery store keeps the fresh mozzarella near the deli and not with the other shredded cheese. Yours may do the same as well. Provolone slices would also work here too. 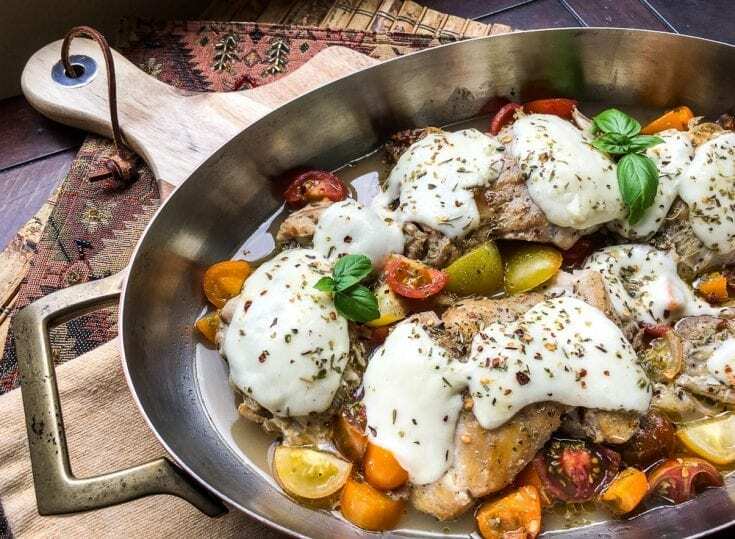 Add 1 tablespoon of your olive oil to your oven safe skillet and use the other 2 tablespoons to coat your chicken. Sprinkle your Italian seasoning, salt and pepper on your chicken and add to your skillet to brown. You are going to add your butter, tomatoes, and chicken broth to the skillet as well. Cover each piece of chicken with a slice of fresh mozzarella and sprinkle with red pepper flakes. Roast in the over for 15-20 minutes or until the chicken is cooked through and the mozzarella has melted over the chicken. Remove from the oven, allow to rest for a few minutes and add any additional fresh herbs. I like basil, parsley or thyme. Serve with a low carb side and enjoy!